This is an enticing Spirit from Brazil, a 3.3 oz, 3” by 1.3” by 1.1” hematite accented quartz with keys all around her flat and healed base. 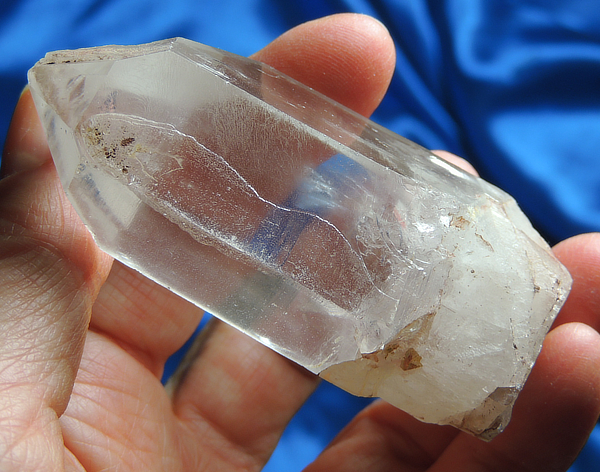 Her Lemurian lines are gently inscribed and interspersed with amazing starbrary glyphs that carry onto her faces and some areas show additional glyphs formed from a very slight, secondary growth of quartz that is more obvious with a loupe. Many of her glyphs are raised and sweeping, although some are rather hieroglyphic looking while others are holographic. With a loupe, you can see even more teeny glyphs! She has a few tiny dings, but is otherwise in excellent condition and is ready to impart her knowledge to her special Keeper ... and she is a very nice handful! Her energies are deep and ancient … and she is an Ancient Starbrary Elder from a race of Star Peoples in the Hydrus system Seen best from the Earth from the South Pole. These peoples explored the Universe before their planet became uninhabitable and they have long since vanished, made extinct by extreme changes in their sun. These ancient echoes so inscribed in this quartz are all that remain of their knowledge, civilization, advances, explorations and philosophy. They were a peaceful and curious people with much to share and their messages will awaken certain of their descendants among the peoples of the Earth. Her rightful Keeper will know her immediately!